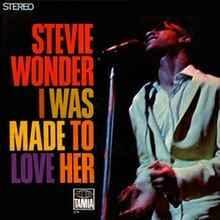 I Was Made to Love Her is the seventh studio album by Stevie Wonder, released on August 28, 1967 under Tamla Records, a Motown subsidiary. Eddie Willis - electric sitar on "I Was Made to Love Her"
^ Christgau, Robert (December 20, 1976). "Christgau's Consumer Guide to 1967". The Village Voice. New York. p. 70. Retrieved June 22, 2013. This page was last edited on 24 March 2019, at 15:39 (UTC).